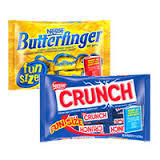 Kroger: $1.12 Nestle Fun Size Bags and Reese’s Pumpkins and Mars Candies! You are here: Home / ALMOST Everything (Featured) / Kroger: $1.12 Nestle Fun Size Bags and Reese’s Pumpkins and Mars Candies! Net Price: $8.92 or $1.12 each!